Hi, Bertie here. I’ve been told it’s Colman’s day today. I didn’t know Colman, so I asked Percy about him. He said he didn’t know Colman. He died on 25th September 2015, which was a couple of months before Percy arrived. He said Kevin used to talk about him, because he was Kevin’s friend. I didn’t know Kevin very well, so that didn’t help. Percy said Kevin was much younger than Colman, which is why he looks so much bigger in this photo. It was taken when Colman was very old. Colman was over seven years old when he died. I’m silver agouti. It’s a very handsome colour. I expect Colman was very handsome in his prime. He looks like a nice chap. It’s sad nobody really remembers him. Except Mummy. I bet Mummy remembers him. Percy here. Sorry I didn’t arrive last week. It was all very busy and I forgot. Not having Kevin around to keep an eye on things has unsettled us all a bit. Mummy’s been sad because he was the last of the Jubilee Seven, as she called them: Hector, Humphrey, Victor, Dylan, Dougall, Colman and Kevin. Before them there was the Fabulous Four: Fred, George, Hugo and Victor. Victor was in both groups. He joined Mummy in 2008 and was only about eight months old then, and lived till he was six years and four months. His anniversary is next Monday, although Mummy says we don’t have to do a memory post for that. We mostly remember birthdays. Although some people don’t have birthdays, so we find a special day for them somehow. Mummy knows how, I don’t. I have a ‘Gotcha’ Day, which was the day Mummy got me from the Adoption place. Colman and Kevin had birthdays which were estimated, according to Mummy, because Auntie Kate had an idea of when they were born. That’s how Colman got to have a seventh birthday cake, and he’s our oldest piggy so far. By the way, I have a lump on my chin and I’m having medicine for it every day. Mummy says I might have to have tests done on it tomorrow. But I’ll be in Dr Sally’s good hands. She’s the best. So I’ll be okay. PS Do you like the dark colour scheme? It’s because were in mourning for Kevin, and will be for seven weeks. That takes us to the 27th June, which is the day before Mummy’s birthday. Kevin reporting today, since I knew Victor. He was a grand old man when I arrived, although then he was only four. He lived till he was six and one-quarter, or thereabouts, and he was the friendliest and most amiable guy you could imagine. Humphrey was friendly too, but a little more reserved. 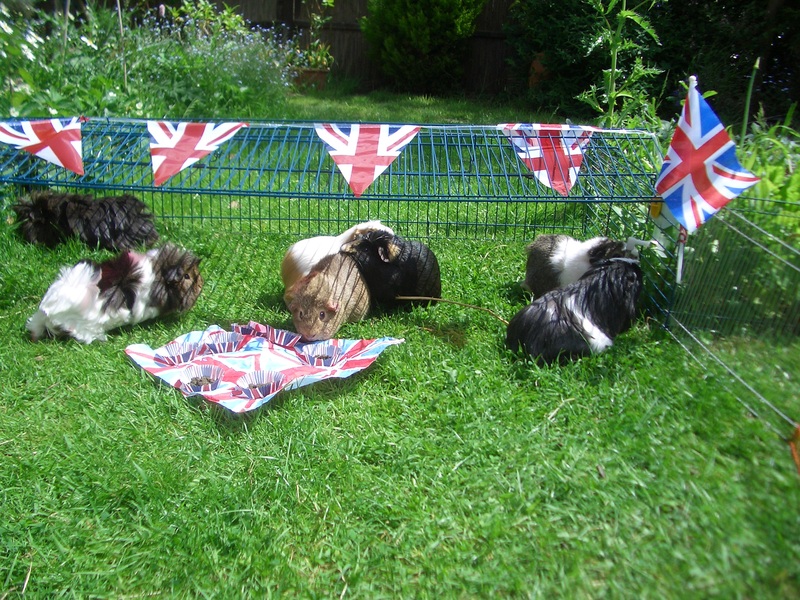 I suppose I may have met him on the floor in the kitchen beforehand, but I always remember the day of the Queen’s Jubilee [in 2012], when we had a party in the garden, all seven of us – Victor, Humphrey, Hector, Dylan, Dougall, Colman and me. There are lots of posts written by him on here – you can click his photo in the ‘Authors’ at the bottom, and read more of his wise words and reportage. I was going to be a day late, anyway, because Victor’s leaving day was yesterday, two years ago. It does seem a very long time. But now I’m late because we couldn’t get onto WordPress yesterday, and we guess nobody could because we couldn’t see Auntie Noelle’s page, or Uncle Lord David’s page either. But we’re back now, and I expect they are too (wave).